Pro Tour Origins has thus far been just as compelling as we had hoped, with an array of interesting new decks on display alongside some updated staples and some very, very clever high level play. Here’s our coverage of Day 1 so you can get caught up. The metagame on Day 1 in Standard has advanced the possibilities for new and renewed strategies including Red/Green Devotion, Red/Blue Thopters, Abzan, Sultai and Blue/Black Control and various flavors of decks built around Rally the Ancestors. And though the field has been diverse, with no one deck making up more than 15% of the metagame, the deck to beat all weekend has looked like Red Aggro, which has defined the durdle clock across the board and punished many a player getting too fancy. So far in paper, the card spikes have been relatively mellow, with Hangarback Walker jumping another $2 from $10 to $12 overnight on speculation that it could become the rare rare card that breaks out above the $10 ceiling and heads for $20. Demonic Pact has also gained $1 or so, from $5 to $6, but will likely need some serious camera time today or an eventual Top 8 to get into the $10+ mythic rare club. Abbot of Keral Keep has also show some growth and could hit $5-6 from $3 if one of the decks running it does well on camera today. 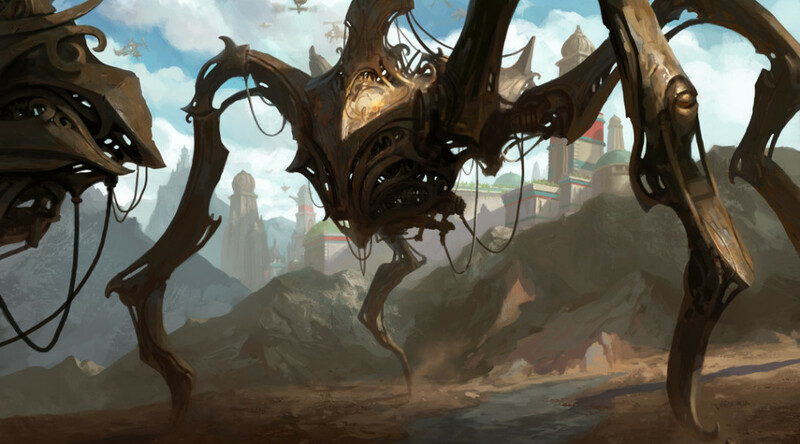 Thopter Spy Network and Exquisite Firecraft have also shown a bit of movement but are unlikely to pop without a demonstration of dominance heading into our Top 8. Now after an additional 3 rounds of ORI-ORI-ORI draft, the stage is set for 5 more rounds of Standard to figure out our Top 8 players and decks. 4:28: Randy Beuhler calls out the UR decks as the best deck of the weekend. 4:32: Herald of the Pantheon and Sphinx’s Tutelage called out as Honorable Mentions for card of the weekend. 4:40pm: Demonic Pact back on camera with the G/B Leon deck. 5:02pm: King of the hill Gottleib has Rally Decks back in the spotlight along with Lilianna, Heretical Healer. 5:17pm: Levy puts See the Unwritten on the map in Standard. Could Battle for Zendikar give it more gas? 5:36pm: GW Constellation on Deck Tech with Kyle Boggemes. 5:50pm: Sam Black runs out Abbot of Keral Keep facing Green-Red Devotion but Gerry T manages to put it away in 3. Eidolon and Zurgo are up on the fact that Red Aggro has been showing up at top tables all weekend and looks well positioned to hold Tier 1 status in this latest phase of Theros/KTK/Origins Standard heading into the fall. A big win this weekend could push the relevant cards even higher, if mostly online. Woodland Bellower is climbing on the appearance of the G/B Demonic Pact deck. Nissa hasn’t shown up as an important 4-of anywhere, and her price has fallen as a result. Hangarback Walker/Thopter Spy Network decks haven’t pushed deep into Day 2 for the most part, allowing these cards to slide back a chunk. The Goggles decks that were kicking around also haven’t driven home, and the key card is also sliding as a result. Sperling takes Game 1 having stabilized at 16 life, and tries to fend off the red advance in Game 2 only to go down to a top decked Stoke the Flames when sitting at 3. Sperling pulls out the third game to make Top 8. Pat Cox makes Top 8 off-camera. One of the U/R Artifacts players also just made Top 8, which could bode well for Hangarback Walker. Takehiro Fujimoto is playing Paul Jackson in the feature area, with Fujimoto on a more goblin-centric version of red against the Jackson GR Devotion build. Jackson knocks Goblins out of Top 8 contention. Local boy Daniel Fournier on the last Deck Tech of the day. Toronto Hype! Note: Demonic Pact has now jumped over $10 on constant coverage exposure and at least one deck in the Top 16. Game 1: Sigrist leverages early flying attacks over top of Deathmist Raptor and finishes up the game with a Shrapnel Blast. Game 2: Gottlieb ties it up after some solid value plays. Game 1: Larsson takes the first game after a flurry of moves and countermoves. Anyone have the U/R Artifact Decklist that is in the Top 8? I can only find a partial one. That deck looks really fun to play. Just bought 15 abbots at 2.86 at mtgfanatic.com. They’re sold now. Good luck getting that order filled from mtgfanatic. They have a terrible history of not shipping anything, stealing your money, etc. Stay away from them at all costs. I’ve used them before to no ill effect, many times. But thanks for the warning. I was going to pull the trigger on at least 20 of those Abbot’s at mtgfanatic.com, but walkere.orr, you beat me to the punch. I did buyout the last 11 of the 26 they had at $2.86 and I too can honestly say I have never had any problems with them been a long time buyer and seller of theirs. Got extremely lucky with a FOIL Demonic Pact @ 7 € (the cheapest after this is 28€ here!!! ), even though I have to pay 10€ shipping. I was able to include a 5€ Hangarback Walker (cheapest one here about 8€), so it to compensate for the shipping fee. I also bought a few Abbots. One for 1,70€ and a playset for 3,75€ each (I missed the spike by a few hours), but I think there is still a huge upside. It’s no Snaps, but it’s potential is not at the peak yet. Wait till someone showcases the power of Abbot in Modern! The Playsets are up to about 6€ per unit. What is the ceiling? 10 € maybe? I doubt the price will change much, no matter if it wins the PT or ends up in another place. Great call by James 2 weeks ago for Abbot. He said it may be the next Snapcaster for Standard. Rally didn’t perform that well. I’m outing mine ASAP. U/R Thopters didn’t receive as much attention as it deserved. Pact and Abbot are over-hyped in my opinion. I’m considering Abbot the red Den Pro and moving on. I like Woodland Bellower’s value more than I like Pacts build-around-downsides. The deck still looks fun though. How about that G/W Aggro list that went 9-1 in standard!!! Hangarback Walker and Evolutionary Leap sideboard tech! Too bad the pilot did poorly in draft eh?